Manage any server on your network through the easy to use left hand navigation tree. Create custom “Views” showcasing up to 36 cameras per layout from multiple servers. For easy layout management, Web Client users can connect to one server and gain access to another’s shared database servers. In a multi-server deployment consisting of a large number of active users the VI Web Client fully supports IIS Load Balancing technology. Load Balancing promotes stability by monitoring your system for bandwidth spikes and then evenly distributing those spikes amongst your servers automatically. Manage your site geographically with Facility Maps. View live cameras by hovering a mouse cursor over any Camera Icon. Admit, Unlock, or Lock any door by simply clicking on its map icon. Door icons also shift colors in real-time based on their states. Create multi-level maps with Layer Map Icons, linking one facility map to another. Import in blocks of users, as individuals or groups from your Active Directory or LDAP database. Set security credentials for users that flow across all viewing clients. Credentials can limit access to cameras, the ability to clip recorded video, or tie down certain camera functions such as the manipulation of PTZs. Locate, Bookmark, and Clip recorded video through VI Web Client’s Graphical timeline. Preview recorded video by moving mouse cursor along the timeline. Place a Bookmark on any event of interest for later extraction. Authorize users can clip, and download video files containing an encrypted watermark. Communication between the Web Client and users browser can be standard MJPEG or with the user of the Video Insight ActiveX control, can be in a secure, proprietary format. In addition, by installing an SSL certificate on the IIS, all data transmitted between the client and the server can be encrypted. 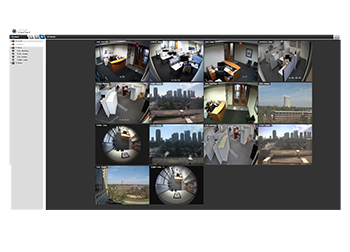 Fully configure your existing cameras, or add new ones into your system. Change individual camera’s recording options such as frame rate and resolution. Even add maintenance notes or configuration reminders linked to a particular camera, all without installing software to do so. The Web Server connects directly to the IP Server and processes via ports 4010 and 4011. The default HTTP port for user traffic is 80, but can be changed to any port in IIS configuration. In a multi-server configuration, a Web Client user can connect to Server 1 and receive live and recorded video from Server 2. Web Client users only connect to port 80 and do not connect to SQL Server or any other port. When using Internet Explorer and the optional ActiveX control, all communication between the server and the client are on ports 4010 and 4011. The Web Client utilized Microsoft IIS and can take advantage of additional integrated security, SSL communication and Load Balancing. The Web Client communicates with the Video Insight IP Server and users can login to any Web Client and authenticated to view live and recorded video from any server. Image processing, including downsampling, is executed on the IIS the user is connected to. When supported by the camera, the Web Client will request a second MJPEG stream from the camera or the Web Client will transcode the video. In all cases, when two or more Web Clients are viewing the same live feed, only one connection to the camera is made. The Web Client supports all browsers and when using Internet Explorer has an optional ActiveX plugin. When using the standard, all images are transmitted as MJPEG to the client. When using High Speed mode, all images are sent using H.264.